As human beings, it’s the most natural thing for us – to follow what feels good. 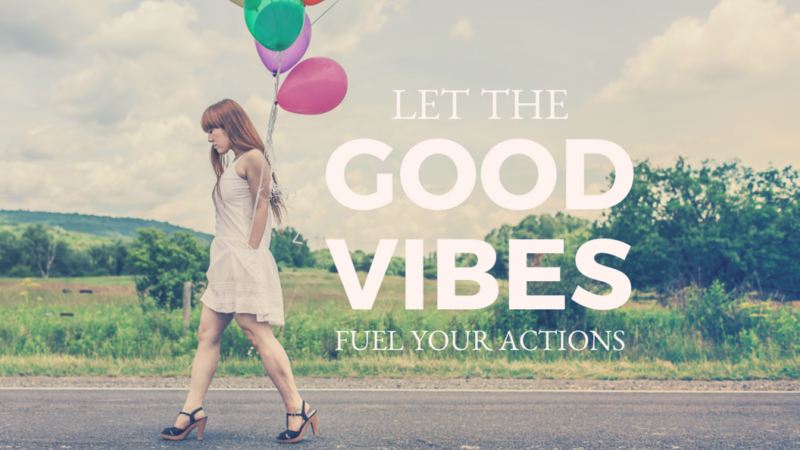 We love to feel good and so we pursue things that make us feel good. Then there’s also responsibility, expectations, obligations, competition. Important factors that fuel our everyday actions too, but they often keep us from feeling good. Blogging about this month’s theme “thinking big” and here I go talking about feelings. If there is anything further away from entrepreneurship, it’s “feelings,” right? We’re all tough as nails. Powerful, rational people. But are we really? Aren’t a lot of the decisions you make as an entrepreneur right from the gut? And the passion that drove you to found your business, isn’t that pure emotion? Earlier this year, I started an experiment on feeling good and its connection with life and entrepreneurship. I started shifting my focus from the big, tangible goals in front of me, toward achieving my biggest goal yet: feeling good along the way. Bear with me here as we explore the links between emotion and entrepreneurship. You wanted a challenge, right? You wanted to take it further than you have ever before? You wanted to think big? I’m challenging you to focus on your feelings as an entrepreneur. Are you up for it? In my work and personal life, I’ve always set my goals as big as possible. While imagining my future self I could already sense the juicy feeling of success and accomplishment. Knowing that when I’d achieve my goal I would feel so powerful. That feeling of ‘I DID IT!’ I believe Walt Disney when he said, “if you can dream it, you can do it”. When your plans are really big, chances are you get disappointed. You might get overwhelmed or frustrated when you notice you are not moving in the desired direction or the destination you are aiming for still seems miles and miles away. Being the big thinker that I am, I’ve had my fair share of frustration and disappointment. And what I’ve learned is that when you are a big thinker, most likely you’ll be a big worrier too. I was raised in an atmosphere where hard work pays off. And the reward is best when you’ve made sacrifices and given it your all. I can honestly say that I’ve gotten so good at this. Being very hard on myself, pushing myself, always needing to accomplish, work hard on success and coping with stress every day. At some point I found myself pushing harder and harder. My goals are always my main focus, no matter what. Working through my frustration. Pushing myself and the people I work with, and my loved ones too. To the point where I got exhausted. And worse – I lost the passion for the initial goal that had been my drive all that time. I saw all the things I had built, begin to crumble. And it felt like I was further away from my goals than I’d ever been, in spite of all the hard work. Worse yet, I had no motivation and no more energy to keep going. What a terrible thing to go through for anyone, but also a very important time to embrace growth. I realised something had to change. I saw all these friends around me sliding into burnouts. Every week I heard about someone else burning out due to excessive exhaustion and prolonged stress, all people my age or even younger. If you are working to reach your goals because reaching them is the ultimate, how much are you willing to sacrifice? How do you want this path to unfold? You don’t know how long this path is or what bumps in the road will come up. Are you up for it? Is the end-goal so important that you are willing to sacrifice almost anything for it? I started thinking – what if working towards my goals could actually be pleasant? What if this journey was about having fun? What if it wasn’t about pushing hard, ignoring emotions, running into walls, but about flowing with ease and joy at every step? Could I get back to that initial exhilarating feeling when you first imagine your goal and keep that feeling while moving toward it? So I started experimenting with this. The first step was a 30-day yoga challenge – practising yoga every morning for 30 days. This cleared my mind completely. I felt energised, in shape, strong, confident and calm. The best part about it: I took on this challenge with a group of friends, we got to support each other and share the transformative experience. Next step: the worrying. I needed to find a way to control my thoughts and stop over-analysing and worrying so much. I followed a program on positive thinking that taught me you can control your thoughts. You can just choose thoughts that will cause you to feel worried or thoughts that will make you feel relaxed. Learning to relax was the third step. Seriously I couldn’t relax without feeling guilty for not being productive. Making relaxing a stressful exercise too. This really took some practice and a shift in mindset. What helped me most was finding things I love to do to, that help me clear my mind. For example, taking a long walk in nature or horse riding. Final step: learning to trust. Trust in me, and trust life. Trust in the fact that things will work out, and that I get to choose whether I’ll be super stressed, or totally relaxed along the way. What a revelation to learn that this is actually my choice to make. And what a delightful idea to just be relaxed, have fun and enjoy the unfolding. That first feeling when you come up with the next big thing you want to do is so powerful! It feels so great! Let that feeling guide you towards it and not the worries and stress of how you are are going to get there. When you start fussing too much about the “how,” and start to lose that exhilarating feeling: practice the four steps above. Your goals are still there, and the excitement about them is too. Yet the focus is on feeling good. No more pushing, pulling, worrying. But enjoying, appreciating and flowing. And guess what? It’s awesome! Things are really starting to work out. On a daily basis, I feel great. I’m attracting all these wonderful, talented people. I get invitations to most the beautiful and inspiring venues. I get amazing business offers, exactly in line with my business goals. More money is coming in. And all this time I’m not pushing anything, I’m just chilling and appreciating all these things while they unfold. For the record: I’m not lying in bed all day. I’m still working but from a place of joy and excitement. And I’m continually practising step 1-4 on a daily basis to really get good at it. I understand it now, but I do need to keep reminding myself to keep it as my main focus. Because it’s very easy to go back to my stressed old-self. Instead of working hard I now say: be there, be prepared, be the best version of yourself and have fun.